Those of you who follow on instagram (@xameliax) will know that last weekend myself and my kicboxing team (+Joe as we had a drop out!) 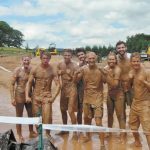 took part in the JCB Mud Run to raise some serious money for 8 amazing charities! 5 miles, 30 obstacles and one hell of a lot of mud!!! We trained hard and on the day we laughed even harder, it was the most fun i’d had in ages! 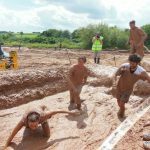 The course was a bit tougher than i’d anticipated with impossible slippy climbs, ab-sailing down banks using just a rope, crawling through tiny concrete tunnels and sinking swamps that if you weren’t careful would have you up to your neck but we all pulled together and made it through in 1 hour 35 minutes! 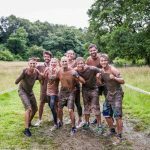 The mud run entry fees went to the NSPCC and with over 2,700 entrants this year the event raised an incredible £51,000 for the children’s charity! 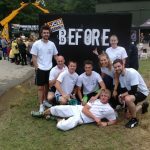 As a group we each decided to fundraise for different charities including Breast Cancer Care, The Alzheimers Society, Motor-Neurone Disease and others and between us on the day our team had raised a whopping £1,000 which has continued to rise since! We had so much fun and really feel as though we’ve made a major difference to our chosen charities that we will certainly be back next year to beat our time and raise even more money! If you want to take a look at us getting covered in mud you can watch my muddy vlog right here! …and everyone else who sneakily donated anonymously, go give these guys some love for their generosity! Apologies if i’ve missed anyone – if you have donated or you do then drop me a tweet @xameliax and let me know so i can add you to the list! If you enjoyed looking through these piccies or if my vlog made you smile then please donate just £1 to my Just Giving page which is still open! If everyone who sees this donates a few pennies then we can make a serious difference to Breast Cancer Care (a charity very close to my heart) and show the world the power of social media! You can DONATE £1 HERE if you’re feeling like a super special human today! I can’t wait until next year…even if it did take me an hour to wash the dirt out of my hair!